Overlay both the ASCAT and WINDSAT satellite winds onto a surface analysis map, all of which are overlaid on Google earth (GE). Just download and save these files. Then open GE and drag the files one at a time on to the globe over Bermuda. They will then update to the latest data every time you view them. The times for each will be different, so you have to coordinate that a bit and compare the satellite pass that is closest to the map time. This process loads these "places" into your Temporary Places in GE, on the left sidebar (might need to check menu view/sidebar). When you close GE you will get the option to save them into your My Places, so they will be there next time you open GE. 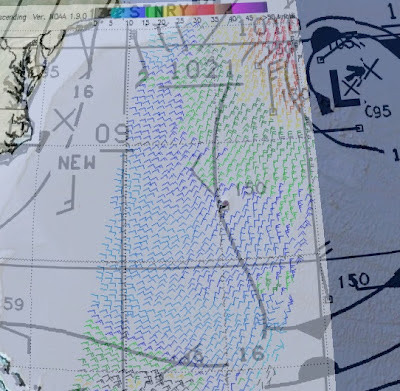 We discuss satellite winds else where in this blog. Just posting these files for now, since the race starts Friday. I will fill in details on how to make them for other areas and how to use them tactically later on. In short, this is the best possible data in that it is real wind, not a forecast. Satellite passes get updated about once a day, sometimes twice. The surface analysis map is updated 4 times a day. Will be best to look at the weather map and just one of the satellite passes at a time, ideally the one with the closest time. You can adjust properties to change transparency level. Besides learning about winds in this region, watching these data sheets over time is a good way to learn the values of satellite data and also to learn the distinctions between ASCAT data and WINDSAT data. 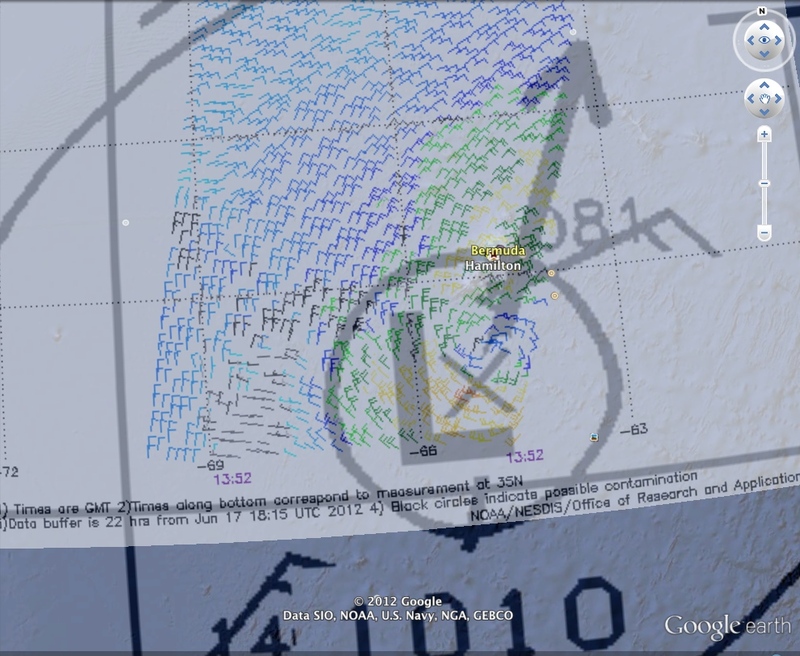 In these examples the ASCAT are higher resolution. If you need help getting this working, give us a call at Starpath and we will help. 206-783-1414. Google Earth must be downloaded and installed. www.earth.google.com. We discussed this trick in Modern Marine Weather back in 2008, but GE has made it even easier to implement now. The only trick is moving the overlays around to get them properly georeferenced. These links have that done for you. Here shows the great value of this process. The sat pass and map are abut the same time, 12-14z on sunday 6/17. We learn details of wind around the LOW that cannot be learned otherwise. For navigators this frequent task is fundamental for computer communications, else we end up with 47d or 47deg or 47*, or worse just 47, when we want 47°. And once we start down that path we might get to 47d 32.1' a mixed format that can lead to confusion, or 47d 32.1m, mixing up days and minutes notation with angular degrees and minutes. It is unforgivable that some soccer TV shows we watch abbreviate 32m 10s as 32' 10". Good communication is a key to good navigation. In a desktop PC, or laptop with a keyboard that has a number pad to the right of the keys, first be sure the Number Lock is on (top left of number pad with a light somewhere indicating on), and then press and hold the Alt key as you type 0176 on the number keypad, ie Alt + 0176 to get °. Without the Number Lock on, you can get almost anything popping up or shifting windows, etc when you type this, depending on what program you have open. It does not work with the numbers at the top of the keyboard. For a Mac, the procedure is Option + 0 (the digit zero) to get °. It works in just about any app on the machine, and no need for a number pad, so laptops are fine. For a PC laptop without a number pad, it is doable but simply too messy to consider a generic solution. In MS Word and other programs that allow for Auto Correct, we simply define Shift + * = ° and use that, which is faster than the number pad solution. Related symbols are ± which is Alt + 0177 on PC or Shift + Option + = on the Mac. In our online classroom forms we have set up a special character set ( ie Ctrl+1 = °, etc. ), but these only work with our online discussion and quiz forms. See Course Overview. The standard ones listed above will also work in our courses.